Over my years shooting digital long exposures of the neon nightscape of Tokyo, I found that there are two basic approaches. One is to shoot as long as possible with as much traffic as possible, while the other is to shoot relatively short exposures while exercising excellent timing. For the basics on this kind of shooting, refer to my previous post on long exposure photography. You can also book EYExplore's Tokyo By Night Photo Adventure to learn all about long exposures in Tokyo. The common strategy for urban long exposure photography is to shoot for as long as possible to get many cars and other moving elements into the shot. This is usually best done from an elevated location looking over a large area such as a highway or multi-lane road, which can accommodate a lot of traffic. An example of this approach would be to use the following settings: f/11, ISO 100, and an 8 second exposure. This is a typical setting that works in the well-lit streets of Tokyo. If this is not long enough the exposure can be lengthened to 30 seconds with a 2 stop ND filter, for example. The long strategy makes sense when we are photographing an open stretch of road with cars moving a good distance away from us. By shooting for 8 seconds as in the above example, we would get longer light trails. In addition, the lengthy exposure might allow lots of traffic to pass through our frame. 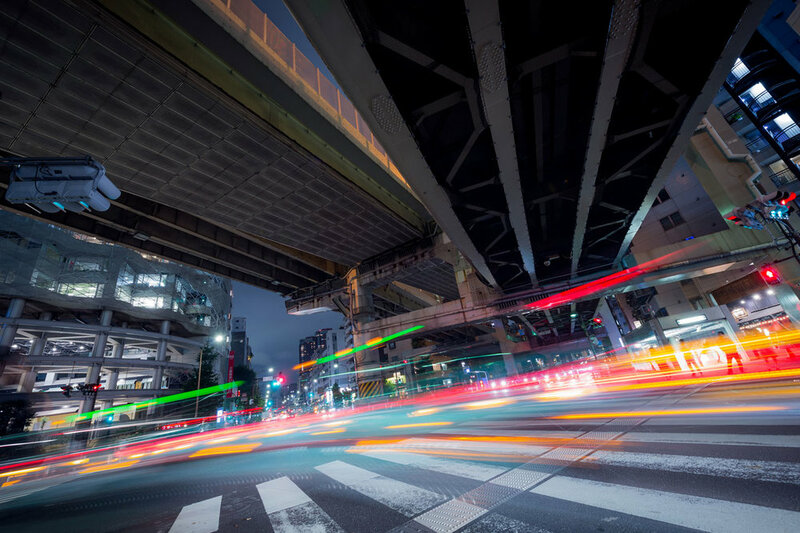 This means that multiple cars will layer on their own individual light trails, resulting in a vibrant and striking image. There is one challenge with the long approach—it requires lots of traffic to ensure that there are cars passing through the shot during most of the exposure. If you only get one car passing through the scene you might end up with a single long, but feint, light trail. This not ideal. For that, we must change strategies. Faced with the problem of low traffic, one might be tempted to give up. But there is another way: we can get close to the road, and reduce our shutter time to around 1-2 seconds. With perfect timing, solitary cars are enough to leave rich and vivid light trails. The lights and reflections on the body work of the cars take on a textured, fluid-like appearance. For example, if we take our previous settings from the above example (f/11, ISO 100, 8 seconds) and reduce the time to 2 seconds, we have made a 2 stop change. Each stop, reduces the light by half, so we went 8 seconds > 4 seconds > 2 seconds. Assuming our exposure was correct, we would have to compensate with either ISO or aperture (or both), so our resulting settings might be f/8, ISO 200, 2 seconds. We increased the exposure via the aperture by 1 stop (changing from f/11 to f/8 is a 1 stop increment) and then we increased our ISO by 1 stop (doubled from, 100 to 200). This results in a 2 stop total change. ENOUGH WITH THE NUMBERS… WHAT DOES ALL THIS MEAN? Walking through an exposure calculation is good mental exercise, but the key takeaway is that relatively short exposures works very well when shooting close to the passing cars. Timing their entry into the frame is crucial, but the resulting photos can be very dramatic. I used a 2 second exposure in my example above, but other times can work too, such as a 1/2 second or even 4-5 seconds. The key is that the solitary car should be in your frame for the same amount of time as your exposure. This obviously depends on the speed of the car, so once again timing is crucial. Next time you’re out shooting long exposures in the city, try the two strategies covered above: shooting lots of traffic for long shutter times from a great distance, and shooting close for only 1-2 seconds and timing individual cars passing in each frame. With practice, you’ll see the difference and you’ll be able to decide which approach works best for each situation.